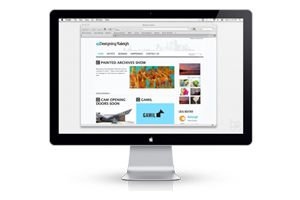 Our web development services create a digital home for your brand. The future of marketing is all around you and its value will only be growing with time. A company's digital presence speaks volumes about the overall quality and value of a brand. Put simply - responsive web designs paired with efficient SEO campaigns are no longer a luxury, they're a necessity. Meeting this necessity is exactly what Haeck Design does best. What Web Development Services Do We Provide? Different needs require different services and that's why our first task on any web development project, is to identify our base resources and functional needs. Once we have assigned our starting and finishing points, we can decide which web development service would be most effective for getting a client to that goal. When starting from scratch, we always suggest responsive web design. This simply means that we create websites with a fluid layout, that automatically adjusts to fit the device it is pulled up on. The steady growth of mobile pushed responsive web design to the forefront, but its future is even brighter. Websites that are pulled up on huge TV's, a Google Glass, an iPhone 8, or a tablet must all look impressive - which is what responsive web design facilitates. If you'd like to build a website with an open source code structure (like WordPress, Joomla, Drupal, or CodeIgnitor) what you're looking for is called a content management system deployment. Our developers are proficient and authored in each content management system listed above, but also on a few, you've probably never heard of. The benefit of being an industry expert in providing content management system deployment is that we can help a client decide which option would work best for their needs, build their site, then ensure they are fully versed in how to properly operate it. SEO campaigns require more than simply buying links or followers, we specialize in organic SEO with a cohesive approach. This means tracking and improving social presence, link statistics, local tailoring, site performance, search results, individual keyword tracking, and much more. Our team uses both Google and Moz Analytics to track results of seo campaigns for our clients and allows tiered time allotment on either a monthly or weekly basis. If you have a website that feels a bit outdated, a website redesign is a perfect solution. Since creating content takes up a good bit of time in building a site from scratch, a website redesign will retain that content allowing us to minimize both cost and time. We simply generate updated mockups, allow clients to make their selection, fold the existing information into the website redesign, and deliver it all in one beautifully updated package. If you'd like to build a unique website style that is built for a specific CMS, then web template creation is the best way to go. Sometimes this means a custom microsite and then there are some clients who prefer to generate a "white-label" theme that they can sell. Our web template creation services are generally intended for industry professionals, so feel free to contact us with any specific technical questions you might have. Designing with sales in mind requires a distinct approach. We focus on producing top-shelf eCommerce website design which allows our clients to increase sales, have visitors easily navigate their website, and most importantly keep the entire process secure. We know which servers to suggest, how to install SSL certificates and manage URL redirections in a way that keeps the sales process smooth. Have a Great Website that Just Needs Some Tweaking? Every day we hear about new security risks and the threat is actually worse then most people want to believe. We harness cutting-edge technologies and our web development services are based on time-tested methods that provide our clients with an elite level of advanced web security. Whether it's internal information, trade secrets, or credit card info, when it comes to important information we believe solid defense is your best offense. Do a little searching online and you'll run across tons of ads for $500/month seo. Even if that provider gives you a momentary boost, what good is that if you're penalized from Google for your black-hat methods. We provide ethical & Organic SEO not just because those penalties linger for quite some time, but because being ethical in all your marketing efforts show that you take your business (and reputation) seriously. Accurate statistics are the only real way to track progress. We set up industry standard analytic programs that allow you to view traffic in real time. If you prefer website statistics, we show you how that data can be segmented and parsed to tease out useful data. If you'd rather we do that for you, we provide monthly website reports displaying only the key indicators in an easily digestible package. Some niches thrive on a personal touch and customized newsletters are a great option for those markets. We select and utilize modern platforms like MailChimp and iContact, show our clients how to use them properly, and customize their newsletters to deliver their intended message and also promote their individual brand. Tracking the success of an email campaign allows you to use your time effectively. It also allows you to tailor a message that will reach more viewers. We leverage analytic resources to provide data related to views, flags, clicks, and shares. Showing our clients how to use this email analysis then allows them to target their message precisely... which should be an email campaign's primary goal. Servers, CMS's, plugins, websites, and widgets all need to be monitored and upgraded on a regular basis. When vulnerabilities are found, they must be patched in order to ensure both security and performance. This is not a high profile job, but we do it proudly because we know that a building can only be as strong as it's foundation. Where Do We Stand on The Issues? We think CMS's are efficient. We believe "Flash" is dead. We took this stance long before "Responsive Web Design" became a trendy industry term. Responsive web design simply means that your website serves the same content and simply adjusts its appearance depending on the device that pulls it up (laptop, tablet, mobile, etc). By keeping all your information in one place, you avoid the confusion created when indexing and addressing SEO. We're happy to explain why responsive design is a better option then mobile dedicated sites, multiple subdomains, etc. - But we do prefer to let you know off the bat, this is the future standard of web design. Using social tools wisely provides your brand with a competitive advantage. Using logins, likes, and sharing functions allow your brand to directly touch your customer base. Just like with CMS's - You're letting fantastically talented companies like Google, Facebook, and Twitter be responsible for providing the "guts" of your social sharing code. At Haeck Design we put our Raleigh web design studio's experience in dealing with this code, then tailor the message to individually fit your brand. Your customers (and potential customers) are already on these networks, we simply provide you with the ability to make the connection. A CMS provides web developers with a huge advantage - Not needing to reinvent the wheel for every turn of the industry. The web is an ever evolving beast and by using a platform that is managed by a team of talented developers, we allow them to handle the code level intricacies so we can focus on tailoring the site to your individual needs. We are major providers and advocates of Joomla, WordPress, Drupal, CodeIgnitor, and Node. If you're not familiar with these technologies, we suggest referring to those links to see just what each platform has to offer. Flash sites were very popular many years ago and some companies still use it... We're not one of those companies. This is a point we don't turn on. Flash is bloated in size, needy in resources, not easily crawlable (in terms of SEO), and really just dated technology. There is a big chunk of designers who spent a lot of time learning Flash in college and they aren't really eager to give it up. Unfortunately, that doesn't change the reality of the situation... in the web development services world, Flash is simply dead technology. Haeck Design designed a new logo for our non-profit. We have received rave reviews and can't wait to roll it out with a new website and marketing materials.